Spring has already sprung and today is World Health Day 2017. In light of these two events, Service Champions is offering this Spring Cleaning Guide to improve your indoor air quality (IAQ) and your overall health and wellbeing. IAQ refers to the quality and health of the air inside your indoor spaces. It is related to the wellbeing and comfort of the home’s inhabitants. According to the U.S. Environmental Protection Agency, “people spend approximately 90% of their time indoors,” which means that poor IAQ can have some serious health effects. Additionally, since indoor air is usually more polluted than outdoor air (“indoor levels of pollutants may be 2 to 5 times, and occasionally 100 times higher than outdoors” according to the EPA), it’s especially important that we try to make our indoor environments healthier and less polluted. People often think that they get sick because of the weather, but more likely, it’s because of increased time spent indoors and exposure to higher levels of airborne pollutants, like viruses and bacteria. Serious health and wellbeing issues can arise if your HVAC system isn’t properly maintained, there are a lot of volatile organic compounds (VOCs) in the air, or if your home is not properly ventilated. If your home was built in the last 40 years, it’s what is called a “tight home.” This means that the property was built to conserve energy with weather-tight efficiency. Yes, this keeps the cold air out in the winter and the hot air out in the summer, but it causes another issue: indoor air pollution. Without proper ventilation in the home, indoor air pollutants become trapped and contribute to unhealthy indoor air quality levels. During the spring, people are hit hard by allergy season. For many, springtime is not just flowers and nice weather, but a time for itchy eyes and constant sneezing. Increased exposure to allergens and pollutants in the home will only increase or even give rise to new allergies and asthma. There’s nothing we can do about the air outdoors, but there are ways to make the air we breathe indoors healthier for our families and ourselves. Duct Cleaning & Sealing — With time, air ducts become contaminated with dust particles, pollen, and other debris that cause allergic reactions and other poor health symptoms. If moisture is present, then the potential for mold and spores being released into your home through the air conditioner or furnace becomes frightfully more likely. Schedule professional air duct cleaning to eliminate the risk for contaminant sources and microbiological growth. Air duct sealing will make your HVAC system more efficient and prevent contaminants from entering your air supply. The goal is to keep contaminants out but heated and cooled air in. 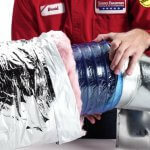 There is a way to do this yourself, but you may need a professional to properly seal all the air duct connections, especially in hard-to-reach areas. If you do decide to DIY it, don’t use duct tape! Instead, use mastic sealant and remember to clean off the area before applying it. Air duct sealing is yet another step to achieving healthy indoor air quality this spring. Learn about our signature PureFlow™ Duct System for properly designed and sealed ductwork. Air Filtration System — Remember that “tight home” we mentioned earlier. This is when an air filtration system comes in handy. Air filter effectiveness is measured by minimum efficiency reporting value (MERV), which ranges from 1-20. The higher the MERV number, the greater the filtration. But, be careful as not all HVAC systems can accommodate higher MERV filters, which tend to be a lot thicker. Check your manufacturer’s manual to see if your system can fit higher efficiency filters. If you want better filtration or simply want to discuss your options, contact the experts at Service Champions. We can improve the efficiency and air filtration of any system. Service Champions IAQ Solutions — To request an in-home evaluation of your current IAQ levels or to learn more about what you can do to keep your family healthy all year round, especially during the spring allergy season, visit our Air Quality page. Learn how UV Air Cleaners can actually kill indoor air contaminants. Vacuum — We know what you’re thinking — duh! But we often only use our vacuums for the carpets. In order to get the most out of your designated Spring Cleaning time, use your vacuum attachments to clean ceiling fans, cobwebs, the crevices of the couch and other furniture, and under the furniture too! 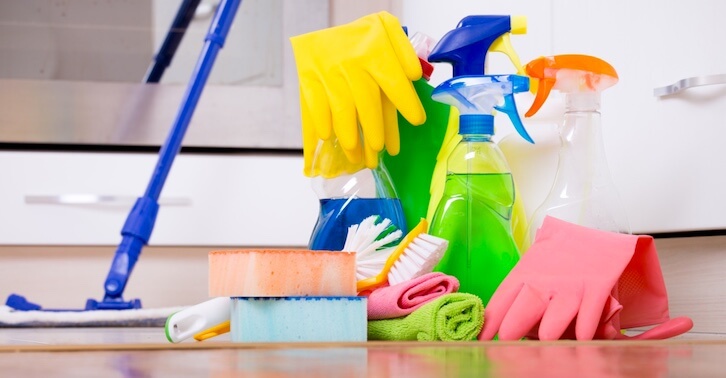 Removing dust is one of the primary goals of Spring Cleaning. Walls & Windows — Dust settles on walls and windows as well, not just on the floors. With some extra TLC during Spring Cleaning time, this can be taken care of. If your walls are painted, grab a sponge or damp towel to wipe down the walls, starting from the top. Don’t just clean the inside of the windows either. Head outdoors to get your windows to the world clear from the inside out. Steam Clean — If you’re worried about exposing yourself to all of those toxins that come along with cleaning supplies (and who isn’t? ), think green this spring instead. A steam cleaner can be used to clean windows, tile, hard floors, and bathrooms. New Bathroom Fan — It’s safe to say that some of the worst air quality is in the bathroom. This room, more than any other, needs proper and effective ventilation. Consider the installation of a new bathroom fan this spring. These ventilate moisture, and remove odor and vapor. 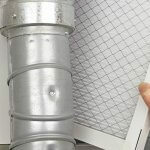 Replace Air Filter — Your HVAC filter should be replaced every 30 to 90 days. Check it monthly, especially if you’ve been using your HVAC system a lot lately. 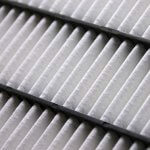 The HVAC filter catches many contaminants and particles before the air gets distributed into your living spaces. Inevitably, your air filter will get dirty and clogged. This is not only bad for your indoor air quality, it can also create some serious airflow problems and may even cause a system shutdown. If your HVAC system isn’t working, check the common culprit — the air filter. Poor IAQ can affect your mood and overall wellness. This year’s theme for World Health Day, taking place on April 7, is depression. By keeping our homes and the air we breathe in it clean and sanitary, we can uplift our spirits, improve our immune systems and solidify our global health impact. A clean and organized home simply makes us feel better, both physically and psychologically. For more information on World Health Day and global Indoor Air Quality guidelines, visit the World Health Organization website. Service Champions is known for trustworthy, on-time home service throughout the East Bay, South Bay, and Sacramento areas. If you have any questions about indoor air quality solutions, don’t hesitate to contact us.